The only facility with onsite management! Read through our website to learn about the many features we offer our valued customers. Then give us a call or stop by today. Our office is open from 9 a.m. to 6 p.m. Monday through Friday and 9 a.m. to 12 p.m. Saturday! Whether you’re in the market for climate control or drive-up access, we’ve got what you need! Each of our unit types come in a variety of sizes, allowing you to choose the space that’s just the right fit. 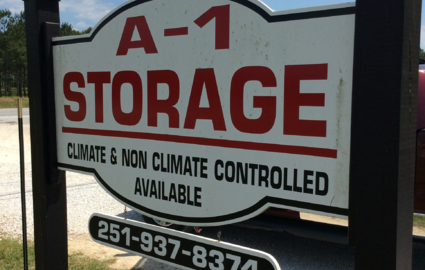 Our climate-controlled storage units range in size from 5’x10’ to 10’x15’, while our drive-up accessible rentals range from 5’x10’ to 10’x30’. All of our spaces are located on the ground floor, so say goodbye to the laborious task of carrying your belongings up and down flights of stairs! Because we’re less than ten minutes away from campus, we’re a great option for local college students in need of some personal space. Our property is about halfway between downtown Spanish Fort and downtown Bay Minette, just half a mile north of the Stapleton Fire Department. With 24-hour access every day and onsite packing supplies for sale, we’re the ideal storage facility for students, families, and business owners alike. Our convenient location also makes us perfect for vehicle owners looking for a self storage solution away from home. Our parking spaces are suitable for trailers, cars, RVs, boats, and more. You can feel safe storing anything from household clutter to your favorite vehicle because we provide onsite management. Our resident manager lives on the property and, with the help of our surveillance cameras, keeps a close watch on facility activity. © 2019 A1 Mini Storage, partners and affiliates.